When Aspen Baker had an abortion at 24, she felt caught between warring pro-life and pro-choice factions. In this hopeful and moving book, she shares how she and Exhale, the organization she cofounded, built a caring, nonjudgmental space for women and men to share their feelings about abortion, without choosing sides. Baker describes how she and Exhale developed their “pro-voice” philosophy and the creative approaches they employed to help women and men have respectful, compassionate exchanges about even this most controversial of topics. Read endorsements by Latoya Peterson, Raven Brooks, and others. 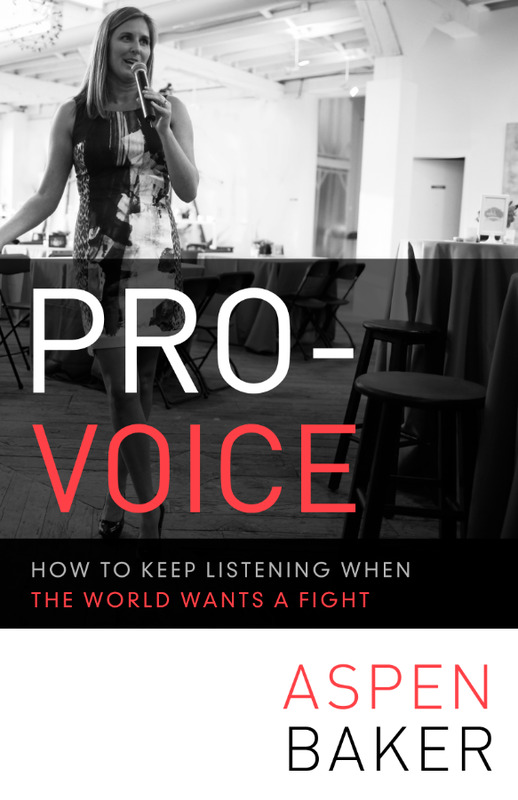 GET exclusive pro-voice news and UPDATES about the book tour! You'll be entered to win a signed copy of the book! We'll share the latest from Aspen and Exhale! Aspen Baker is the Founder and Executive Director of Exhale, and author of the award-winning book “Pro-Voice: How to Keep Listening When the World Wants a Fight." Called a “fun, fearless female” by Cosmopolitan, Baker gave the first TED talk on abortion at TED Women 2015. She is an award-winning leader who has been featured by CNN, Fox, the New York Times, NPR and many more print and broadcast media. She is the most prominent voice in the nation on how to transform the abortion conflict into peace.